Updated to reflect the cancellation of Chris Brown’s One Hell Of A Nite tour at the Scottrade Center on Aug. 13. While the summer may be winding down, the action in the St. Louis region is still hotter than ever. Start your festivities off the right way and let Metro get you to the excitement. Shania Twain will bring in her Rock This Country tour to the Scottrade Center, tomorrow Aug. 4. Need a laugh? One of comedy’s biggest stars, Kevin Hart, will bring his What Now? tour to the Scottrade Center Aug. 21. Next door at the Peabody Opera House, fans will get the opportunity to get up close and personal with the top five idols from Season 14 of American Idol at the American Idol Live tour on Aug. 10. Avoid construction, traffic jams and the hassles of finding a parking spot by taking Metro. Leave your vehicle at any of our 21 free Metro Park-Ride lots in Missouri and Illinois, and take MetroLink to the Civic Center MetroLink Station (just steps from the Scottrade Center and Peabody Opera House). 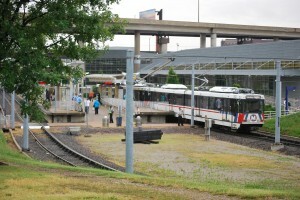 You can also hop on MetroBus to get downtown. The Civic Center Transit Center, located at the intersection of 14th and Spruce, serves more than a dozen MetroBus routes. To plan your trip on public transit, use our handy Trip Planner tool or download our official mobile app, Metro On The Go.